Diversification, extending opening hours and optimising your Google business listing are just three strategies for boosting the fortunes of your newly acquired laundromat. ‘Muck and money go together’: the laundry industry has long proved the truth of this old English proverb. In South Africa, creeping urbanisation is a major driver for growing demand for laundry services, and automation has helped the industry meet that demand cost-effectively. The growth of white-collar work in a country the World Bank describes as “two-thirds urbanised” has also given the sector a steady rise in custom from office professionals for dry cleaning services. So how does an entrepreneur in the laundry sector actually go about converting ‘muck’ into money? Here are a few pointers if you want to start or buy a laundry, or laundromat, as they’re also called. success, more than anything else, depends mostly on how well you deliver that service from day one. Another obvious and simple part of the job is collecting money from your machines and keeping public areas as clean and hygienic as possible. It’s an uncomplicated business model. Coin-operated facilities are non-labour-intensive – usually one person manning the shop is enough – but you do need to spend cash on maintaining your machines, which are prone to breaking down. Is there room to squeeze in any more machines? More cash-strapped businesses may consider reconditioned washers and dryers or equipment leasing – but be sure there is enough demand to justify such an investment first. Having larger machines that accommodate bigger loads can be a big pull for customers. A laundry operation will consume large quantities of soaps, detergents and other cleaning agents so you need reliable suppliers too. Furthermore, in a water-poor country like South Africa, your water consumption is likely to form a major part of your operating costs. Your business insurance, meanwhile, must cover the risk of equipment breakdown, vandalism and public liability, for in the event that an expensive suit is damaged or a freak accident occurs. If you run a collection and delivery service, you will require motor insurance too. This is a convenience industry where customers will expect to access your services outside of working hours. If you’ve bought a laundry with restrictive opening hours, then extending them is an obvious way to boost profits. In fact, going 24/7 might generate more revenues than costs. A coin-operated service need only be manned by one staff member, making it easier to keep it open late at night. Be aware, however, that opening round the clock could affect your insurance premiums, while the terms of your lease may prohibit you from opening beyond certain times. Michael Bate of Northern Cleaners in Johannesburg told BusinessesForSale.com that attention to detail matters if you want to keep customers coming back. Assuring a great service every time is contingent not only on your own expertise but that of your staff too. Most small laundromats can be run by the owner with no help, though you’ll need some support so you can take days off and have some cover when you’re ill. It’s a low-skilled occupation of course, so your priority should be hiring people who are reliable, conscientious and friendly and helpful to customers. There are myriad ways of adding new income streams to a coin-operated-only laundry. You could add a collection and delivery service, for instance. You could also become a hybrid enterprise, with an unmanned public laundromat installation supplemented by specialist services such as dry-cleaning, shoe repairs and key-cutting. If you’ve bought a fairly large operation that relies solely on walk-in trade, you could introduce some recurring revenues by securing contracts with hotel chains, hospitals and other commercial enterprises. “Diversifying into all aspects of the cleaning industry has been great,” said car-wash veteran Michael Bate. “Dry cleaning in South Africa is very seasonal, so we’ve had to branch out into other areas of cleaning. “For example, we generally receive less during the summer months as people wear a lot of ‘wash ‘n wear’ items during these months. In the winter we become busy with jackets, jerseys, coats, scarves etc from both ladies and gents. Some laundromats have even diversified in order to enliven customers’ experience while they wait, offering food and drink, activities for children or even live music. Offering bags and other garment packaging printed with your company details is one way of extending a convenience to your customers while simultaneously promoting your laundry services. Many people consult Google to find a laundry and proximity is usually the decisive factor. It is therefore worth optimising your Google business listing and boosting your position on Google search results for key terms like ‘laundry in [your area]’. Customers can leave reviews on Google Business, so a high quality service can boost online conversions too. 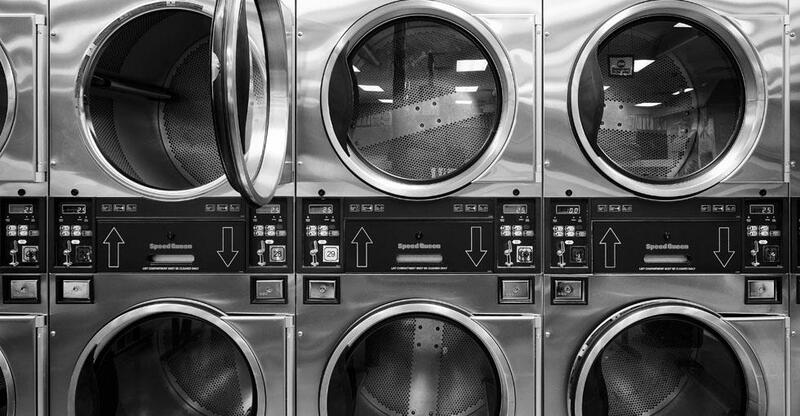 Read this to find out how to sell your launderette!